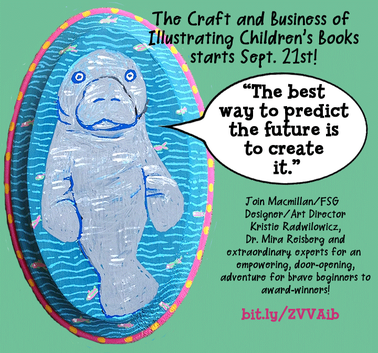 Last year's course was co-taught with Kristine Brogno, Art Director of Chronicle Books. This year, Art Director Kristie Radwilowicz of Macmillan/FSG will co-teach the course. Daily Self-Paced Lessons - Each day, students accessed a site that covered a lot of information about the craft and business of illustrating: the structure of picture books (portfolios, dummies, thumbnails, concepts, etc. ), craft tips (watercolors, acrylics, figure drawing, world building, color theory, perspective, and more), and behind the scenes in publishing (interviews with art directors, editors, illustrators, tips on submitting work). These lessons are available for six months after the end of the course. Weekly Webinars with the Instructors to Critique Assignments - Each week, students turned in assignments (creating thumbnails, character sketches, finished illustrations, promotional postcards). Mira and Kristine spent at least an hour in a live (and recorded) webinar each week critiquing the submissions. Each student was critiqued at least twice over the five webinars. Facebook community page - Students joined a private Facebook group to share information, critiques, and general support. Optional critique - When signing up, students had the option of adding a one hour Skype critique with either Mira Reisberg or Kristine Brogno. A nice combination of self-paced and interactive learning. The daily lessons were there at my convenience, and I could pick and choose the information I wanted or needed. The webinars and Facebook groups provided interaction and feedback. The community of illustrators. The class was filled with talented and dedicated illustrators, ranging from beginners to accomplished and published illustrators. Every one was generous with their time and advice. My small critique group continues was a very talented bunch: Daria Peoples, Jami Butler, Patrick Guindon, Jill Harp, and Iris Biran. The homework and feedback gave me the structure to complete a dummy & a finished illustration. I've been working on a picture book manuscript for awhile and wanted to do a dummy for it for the last year. It finally took this course to motivate me to do it. Completing the thumbnails for the first assignment and getting valuable feedback from Kristine Brogno gave me the momentum to develop the dummy. The illustration assignment pushed me to create a finished piece. My one-hour critique with Kristine motivated me to pull together the dummy. Mira Reisberg & Kristine Brogno's wealth of knowledge. Both Mira and Kristine brought so much experience and knowledge to their weekly critiques. It was so helpful to listen to them give advice to all of the work presented. I had a great experience with the course. As a relatively experienced illustrator, it was perfect for me to get encouragement, feedback, and motivation to work on my illustrations. I also picked up some good information in the craft lessons. The amount of feedback from two consummate professionals in the field was invaluable. I assume this year's co-teacher will be equally awesome. I was also lucky to have an active small critique group. Getting feedback from other illustrators has always been important for me. So check out the course. An active critique group for a course like this is absolutely essential...and, for me, can make or break a course. :) Thanks for a terrific review, Sylvia! Have you taken this course, Teresa? I'm very interested. Do you think the extra $100 for the 1-hour skype critique is worth it, and would you (as a "relatively experienced illustrator") pick Kristie or Mira for that? That is a one-on-one critique, right, not a group critique? Yes, it's a one-on-one critique and very much worth it. Both will give great critiques; it may depend on where you are in your illustration path. Great review of the course, Silvia.